Modern Needs is listening and dance party with special guest DJs and monthly musical themes, held the third Friday of every month at the great Last Exit bar in scenic Brooklyn U.S.A. 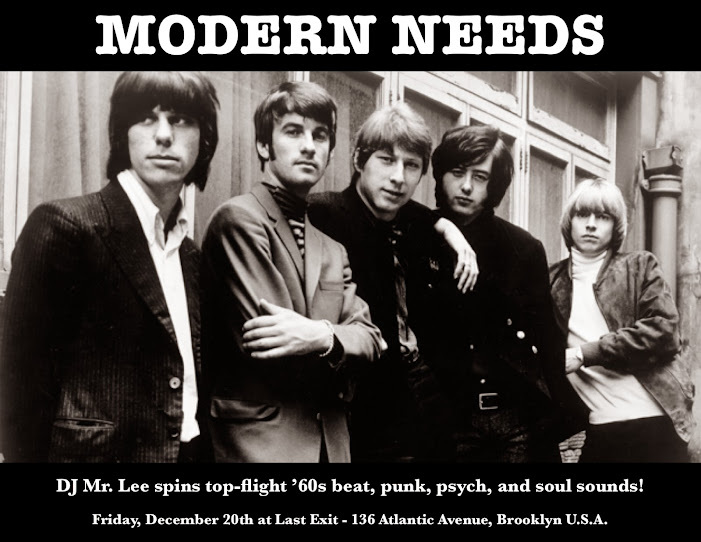 The December edition is a rarity, with no special guests, just your host and boss deejay, Mr. Lee (Going In Style Sound System/Dead Flowers Productions) spinning top-flight '60s beat, punk, psych, and soul, with a few sonic detours along the way... As always, Modern Needs is a vinyl-only affair! 136 Atlantic Avenue, Brooklyn, U.S.A.